Free Cricket Nets: Oval and Lords! Metro Blind Sport have organised three exciting opportunities to try cricket in 2019. Want to try Blind Cricket, Well now is the time, there is no better way than learning for our talented cricketers plus why not do it at the best Cricket nets in London, Yes that right, learn at the Oval and Lords in January, Feb, March, Start off your 2019 right and join in. Event details below. Are there any better locations in the UK to try it out! There is no doubt you will be learning from some talented cricketers and you will be in good company as the Metro Cricket Team won the Blind Cricket England and Wales league in 2018. Want to try Blind Cricket, Well now is the time, there is no better way than learning for our talented cricketers plus why not do it at the best Cricket nets in London, Yes that right, learn at Lords in March, Start off your 2019 right and join in. Metro cricketer jumps over the wicket to get the run! 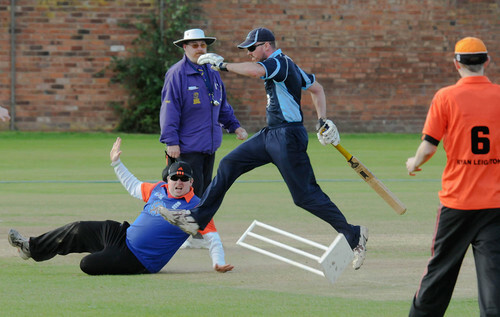 Metro Blind Sport have organised exciting opportunities to try cricket in 2019. Want to try Blind Cricket, Well now is the time, there is no better way than learning for our talented cricketers plus why not do it at the best Cricket nets in London, Yes that right, learn at Lords in Feb, March, Start off your 2019 right and join in. Event details below.